This is a weekly spelling contract for students to complete. 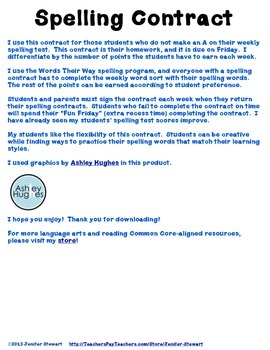 I use the Words Their Way program in my fourth and fifth grade reading classroom, and those students who do not earn an A on their weekly spelling tests have to complete this contract for homework. This resource can be used as a literacy center or as homework. It is differentiated by the number of points a student must complete each week. 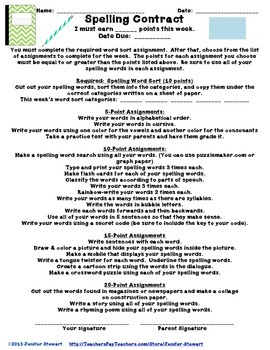 Every student must complete the Words Their Way weekly word sort; the rest of the points can be earned from the list of choices on the spelling contract. Students are provided with the flexibility of the choice of activities. Students can earn points based on their learning styles. 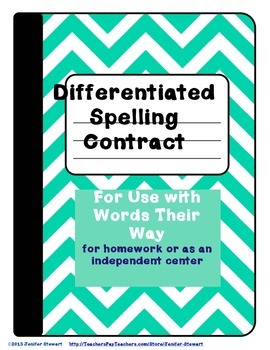 Watch your students' spelling improve with this weekly, differentiated spelling contract!